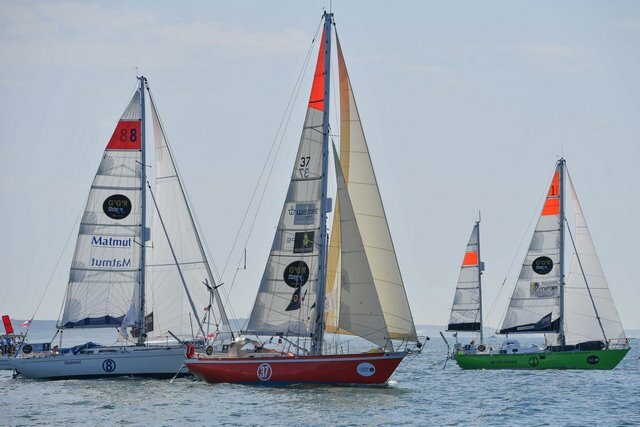 They have 30,000 miles to sail over the next 9-10 months, but judging from the start today of the 2018 Golden Globe solo non-stop around the world yacht race from Les Sables d’Olonne, the leaders will be fighting over every mile. 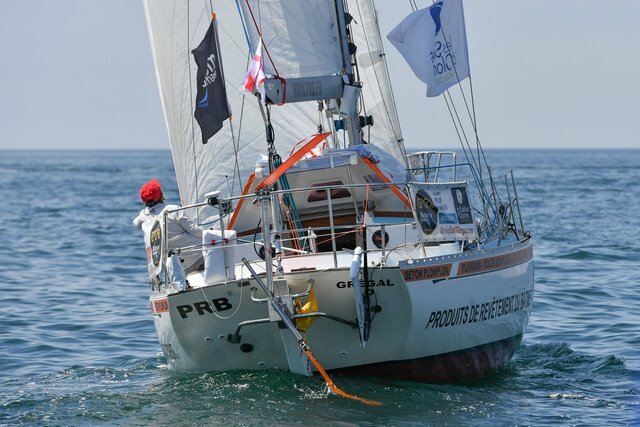 First to cross the line at Noon (CEST) was the fiercely competitive Frenchman Philippe Péché aboard his Rustler 36 PRB. He has ensured that she is one of the lightest in the 18-strong fleet, and carrying a huge lightweight genoa, Péché pulled out a 100 metre lead within minutes of Sir Robin Knox-Johnston, winner of the first GGR 50 years before, had fired the canon from the deck of his historic yacht Suhaili. Behind him, Jean-Luc Van Den Heede, who has five previous circumnavigations to his credit and at 73, is the oldest skipper in this Race, appeared to tangle with Tapio Lehtinen’s Finnish yacht Asteria, and one hour after the start were still locked in a 3-way tie with Dutchman Mark Slats (Ohpen Maverick) for third place. Their regatta style tactics allowed Russia’s Igor Zaretskiy to sail his Endurance 35 Esmeralda quietly into second place. 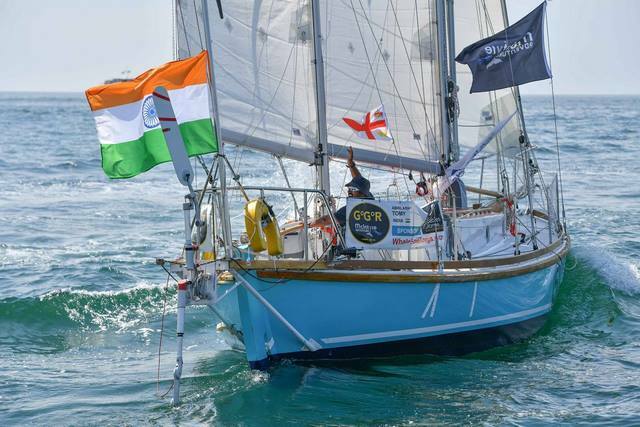 Another in the mix was Are Wiig’s 32ft Norwegian double-ender Olleanna along with Indian Navy pilot Abhilash Tomy sailing a wooden replica of Sir Robin’s Suhaili. 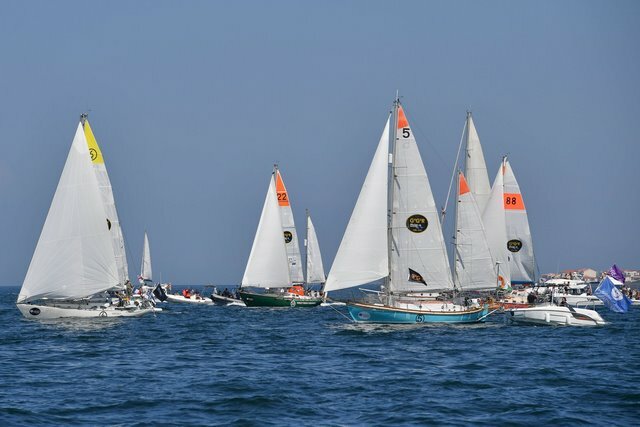 By contrast, Britain’s Susie Goodall, who raised by far the biggest send-off from the dock, kept her Rustler 36 DHL Starlight well clear of other yachts and made a good mid fleet start in line with Istvan Kopar’s American yacht Puffin, fellow British entrant Ertan Bescardes (Lazy Otter) and Antoine Cousot’s French Biscay 36 Métier Intérim. The dark horse within the fleet appears to be Nabil Amra’s Palestinian flagged Biscay 36 Liberty II, which was one of the last boats across the line but last night was flying through the fleet at 4.6knots as apposed to 4.2 for the leaders. 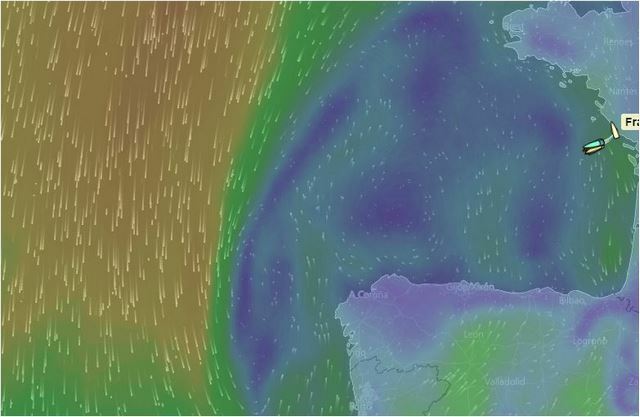 Like Igor Zaretskiy, he is taking a more southerly route towards Cape Finistere while others were heading well out into the Bay of Biscay in the hope of finding stronger winds. One skipper, Italy’s Francesco Cappelletti, remains in port preparing his Endurance 35 007. The yacht has still to pass safety inspection and Cappelletti has yet to complete 3 days of solo sailing trials. He has until Noon next Saturday to beat the deadline to join the race. The leading yachts are expected to reach the first ‘gate’ set off Lanzarote in the Canaries around 11th July to hand across film and letters. 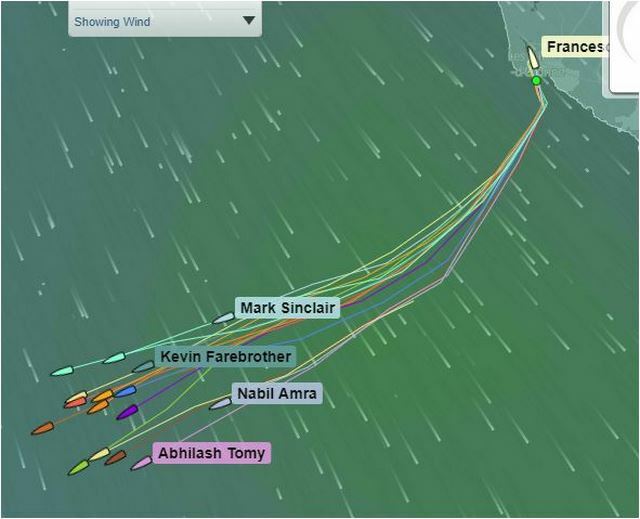 The Race is expected to take 9-10 months with the leaders taking between 240-250 days to complete the voyage unaided. Today, technical partner Boatshed.com announced that they would provide a £5,000 cash prize the for the fastest skipper around the world – the same amount that the Sunday Times newspaper posted for its race 50 years ago. 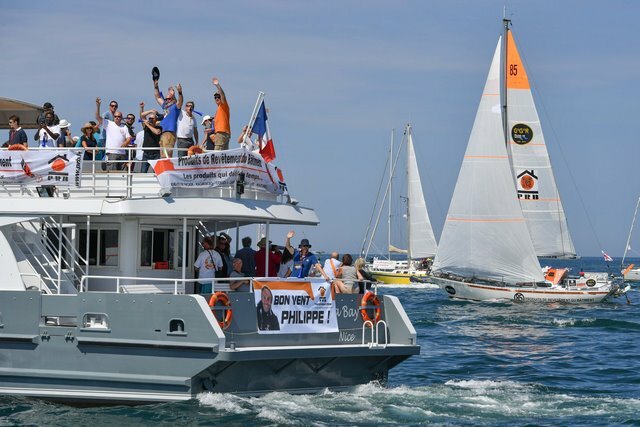 To celebrate Sir Robin Knox-Johnston’s historic 1968/9 world first solo non-stop circumnavigation in the Sunday Times Golden Globe Yacht Race, a new Golden Globe Race will be staged to mark the 50th Anniversary of that epic, starting from Falmouth on June 14th, 2018. Like the original Sunday Times event,the 2018 Golden Globe Race is very simple. 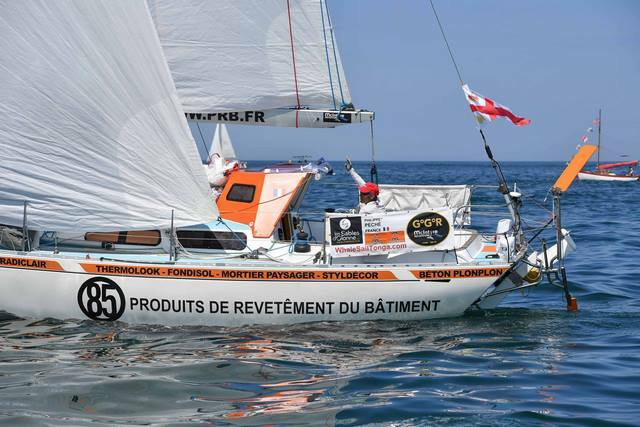 Depart Les Sables-d’Olonne, France on July 1st, 2018 and sail solo, non-stop around the world, via the five Great Capes and return to Les Sables-d’Olonne. 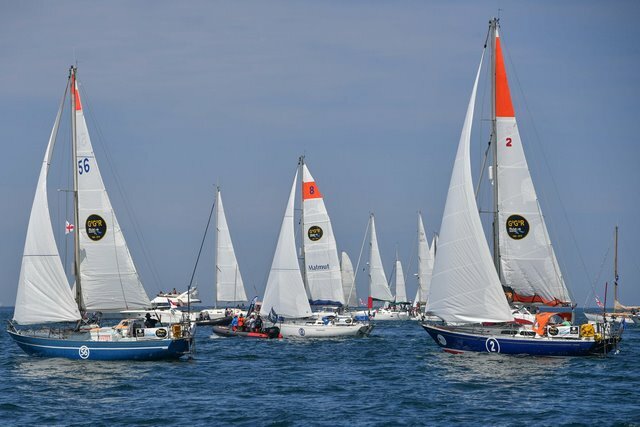 Entrants are limited to sailing similar yachts and equipment to what was available to Sir Robin in that first race. That means sailing without modern technology or benefit of satellite based navigation aids. 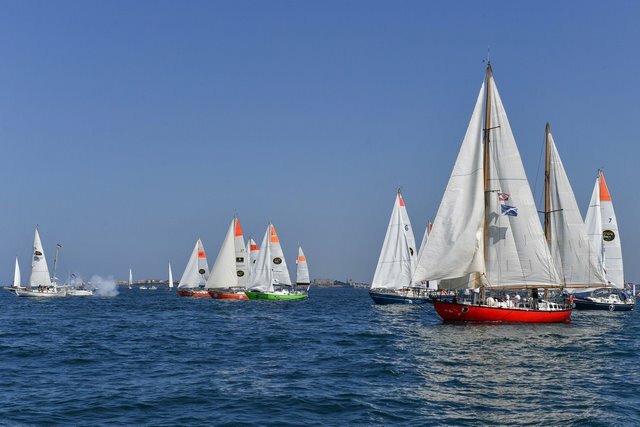 Competitors must sail in production boats between 32ft and 36ft overall (9.75 – 10.97m) designed prior to 1988 that have a full-length keel with rudder attached to their trailing edge. These yachts are heavily built, strong and sturdy, similar in concept to Sir Robin’s 32ft vessel Suhaili. In contrast to the current professional world of elite ocean racing, this edition travels back to a time known as the ‘Golden Age’ of solo sailing. Suhaili was a slow, sturdy 32ft double-ended ketch based on a William Atkins ERIC design. She was heavily built of teak and carried no computers, GPS, satellite phone nor water-maker, and Robin completed the challenge with no outside assistance or aid of modern day shore-based weather routing advice. He had only a wind-up chronometer and a barograph to face the world alone, and caught rainwater to survive. But he was at one with the ocean, able to contemplate and absorb all that this epic voyage had to offer. This anniversary edition of the Golden Globe Race is a celebration of the original event, the winner, his boat and that significant world-first achievement. Competitors in this race will be sailing simple boats using basic equipment to guarantee a satisfying and personal experience. The challenge is pure and very raw, placing adventure ahead of winning at all costs. It is for ‘those who dare’, just as it was for Sir Robin. They will be navigating with sextant on paper charts, without electronic instruments or autopilots. They will hand-write their logs and determine the weather for themselves. Only occasionally will they talk to loved ones and the outside world when long-range high frequency and ham radios allow. It is now possible to race a monohull solo around the world in under 80 days, but sailors entered in this race will spend around 300 days at sea in little boats, challenging themselves and each other. The 2018 Golden Globe Race will be a fitting tribute to the first edition and it’s winner, Sir Robin Knox-Johnston. “I was first exposed to the inaugural 1982 BOC Challenge Around Alone Race during the Sydney stopover, working on Aries wind vanes used by competitors. I spent time with them all. We laughed together and I heard their stories. I met my boyhood champion, Robin Knox-Johnston and was hooked. I decided to compete in the 1986 event, but with a part built boat, I ran out of time, so had to be content in the roll of Sydney BOC Race Chairman that year. Competing in the 1990-91 BOC Challenge was one of the highlights in my life. On reflection, I always considered myself luck as, in my opinion, it was the last of the ‘Adventure events’. Each future race became increasingly performance orientated, sailed by elite sportsmen and women in ever more extreme yachts, focused on winning at all costs. Nothing wrong with that, in fact it was and still is incredibly exciting, but it was simply a lot more of an adventure in 1990. My dream to sail solo around the world was borne of inspiration gained while following the solo voyages of Francis Chichester, Robin Knox-Johnston and Bernard Moitessier, and reading about Chay Blyth, Blondie Hasler and others from the ‘Golden Age’ of solo sailing. To create a unique ‘RETRO’ non-stop solo around the world yacht race, in the image of the original Sunday Times Golden Globe that draws sailors back to the Golden Age of ‘one sailor, one boat’ facing the great oceans of the world. To organise a race where adventure takes precedence over winning at all costs. To professionally manage an event where the sailors skill and traditional seamanship alone, rather than modern technology or support crews, gets them home and where the achievement truly belongs to the skipper.